Approaching its 25th anniversary, iconic Hong Kong Triad effort ‘Young and Dangerous’ made a huge splash upon its initial release and spawned an equally beloved franchise as well as made stars of its hip young cast. 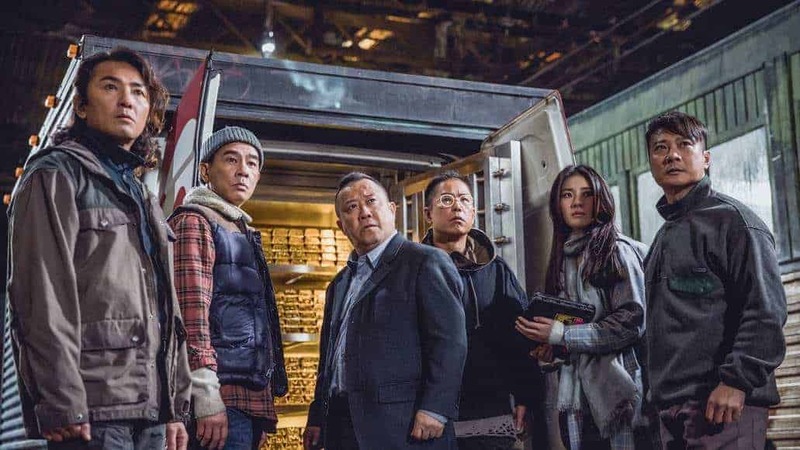 Now reuniting the main cast cast of that effort into this unrelated new film tackling the mega-heist genre of action film, ‘Golden Job’ arrived in digital download and Blu-Ray from WellGo USA on April 9. Pulling off a successful mission, childhood friends Lion, (Ekin Cheng, from “Rule Number One”) Crater, (Jordan Chan, from “Bio Zombie”) Ding, (Chin Kar Lok, from “Lust, Caution”) Bill, (Michael Tse, from “Turning Point”) and Mouse (Jerry Lamb, from “Street of Fury”) decide to go their separate ways when they’re called back together again. Believing they are stealing a shipment of medical supplies to deliver to a refugee camp, the group is shocked to discover the target is actually gold bars intended to be used to fund political coups in third world countries. Realizing that they’ve been duped and double-crossed by one of their own, they soon are faced with the deadly decision that their band of brotherhood has to be put to rest in order to fully be safe from their once-friendly rivalry.The group puts their skills to the test as they set out to right the wrongs and put an end to things once and for all. For the most part, ‘Golden Job’ offers up plenty to like about it. As is most important in heist films, the central crew have to come off as the kind of competent professionals that can pull off dangerous stunts and missions due to their chemistry. It needs to be plainly obvious that they’ve been around each other long enough to build the trust for the timing to pull off the various plans needed to accomplish their mission. This is especially true of the beginning where the elaborate, complicated plan to pull off the heist at the symposium is a perfect example which moves through a complicated plot as they try to get out using their skill-set. Their later efforts during the heist on the streets of Budapest to secure the transport vehicle are absolutely ingenious and manage to score incredibly well showing how they were pulled off. That sequence shows off their ingenuity, planning and timing even more, which makes for a fun time being around professionals in that manner. On top of the heist work, ‘Golden Job’ also scores on the regular action front. There are several explosive car chases choreographed by Ka Lok Stunt Team that manage to mix the traditional banging and smashing of metal with some rather creative stunt pieces. Showing cars somersaulting in the air on fire or utilizing obscure parts of rubble and debris as ramps to catapult themselves around immovable objects, the scenes in the chase in Budapest provide a thrilling experience when buoyed by the multitude of shootouts throughout here. The dynamic encounter in a train yard after recovering the gold to the escape from the car show featuring both shootouts and insane stuntwork, highlights the fact that the action in the film is incredibly fun. As well, this setups the furious finale which is the assault on the seaside compound, packed with plenty of frenetic action and flying bullets choreographed by Ka Lok, Alan Ng and Tang Sui Wah which features the cathartic response and the visual excitement required for such a scene. Moreover, there’s a rather strong and prominent theme of brotherhood and loyalty running in the film. Writers Kim Dong Kyu, Kwok Kin Lok, Erica Li and Heiward Mak go for a layered approach to the story that builds on the theme of the group unity and brotherhood that requires plenty of emotional connections between the members. We’re shown their brotherhood from the very beginning with the group as kids fighting as one and rallying around each other, carrying out decisions as a group and taking advantage of their bond is all fully in league with their group dynamic. There’s enough shown here early on that sets up the middle section where we’re dropped into the double-crossing and eventual charge into the mission that puts that in jeopardy, which is exceptionally well-written at changing that mindset. With Bill’s statement about the team being about brotherhood but only when it’s to his detriment and putting everything on its head when they now have to fight one of their own who’s out for their own interests, there’s a rather enjoyable storyline utilized here about the importance of friendship and brotherhood. However, there are some flaws within ‘Golden Job.’ The biggest issue here is a rather disjointed pacing in the middle section where this goes into several tangents that don’t offer any kind of excitement or enjoyment at all. This is all about the sluggish pace-destroying scenes in the Japanese village that just slow this one down considerably, with rather bland dealings about the group recapturing their bond after Lion’s incarceration or learning how to make sake with the rest of the villagers. The scenes are generally boring and just interrupt the pace about escaping from the group seeking them for the stolen gold with the group getting cozy with each other or engaging in the preparations for the drinks. Likewise, the other problem is some shoddy and obvious CGI used that’s not all that impressive, mostly for the crash sequences in the car chases that attempt to add a spectacle but just look too fake in their execution. Otherwise, there aren’t too many issues with the film. While featuring a few minor flaws and having a lot of rather exciting positives, ‘Golden Job’ manages to sustain itself really nicely and has more to offer than just a reuion of a beloved cast. Give this a look if you’re a fan of the group from their past works or looking for a nice modern action with some flair, while those that look for more complete fare should heed minor caution.